Ever since it has become a bit more chilly I have been craving foods that are typical for fall. Lately, my newest obsession is butternut squash. Everything that includes butternut squashes, ranging from simple roasted, soups, stews or curries, I’m in! 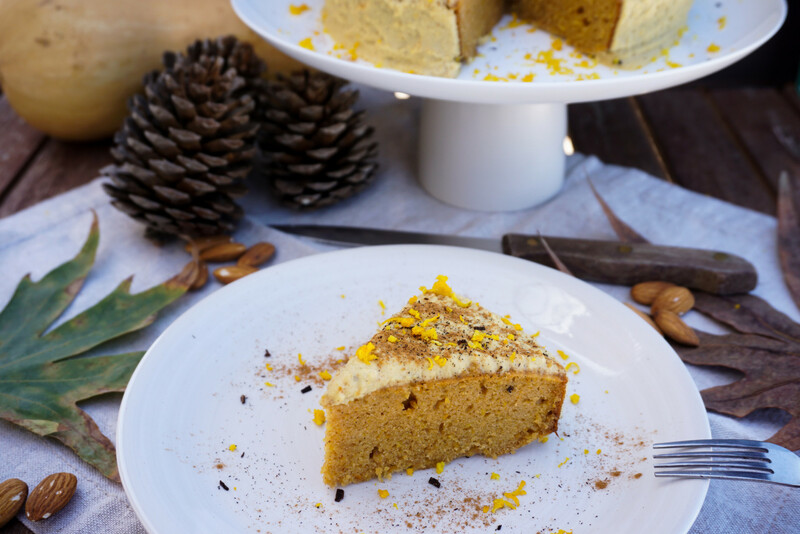 In line with the theme I decided to divert from the classic pumpkin pie recipes and try out this exciting Butternut Squash Cake! 🙂 Honestly, it is such a perfect combination. 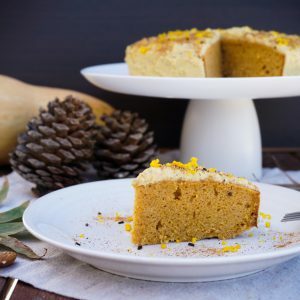 I don’t have much experience with pumpkins or squashes in baking, but this recipe is so rich in taste, fluffy, moist and just perfectly spiced that I will be including pumpkin and squashes a lot more to upgrade my baking game. For the frosting I chose a heavenly almond orange cream, which perfectly compliments the fluffy Butternut Squash Cake. 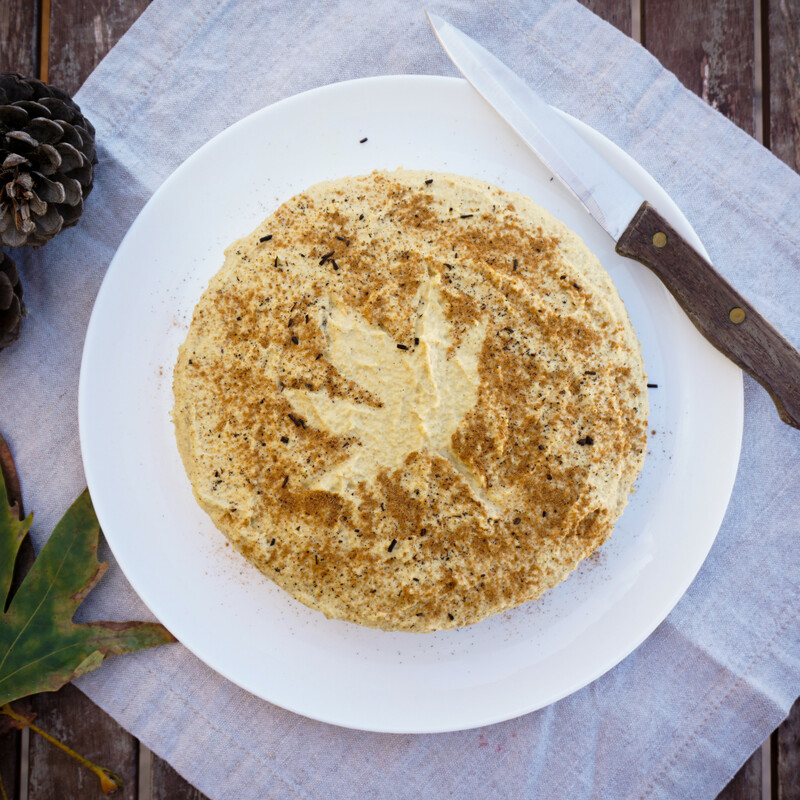 If you are looking to make this cake gluten-free, just replace the spelt flour with a gluten-free flour mix. For sweetener, you can use any natural liquid sweetener that you like. Personally, I just discovered coconut nectar for myself. It’s a great natural alternative as maple syrup is crazy expensive in Cyprus. Make sure that you soak the blanch the almonds before soaking, as the peel will most likely change the colour of the frosting. The easiest way to blanch almonds is to simply boil them for exactly 1 minutes, then rinse them with cold water and pop off the peel with your fingers! Afterwards, make sure to properly soak the almonds for minimum 6 hours (best overnight) for the creamiest results. Line a non-sticking cake tin with parchment paper and grease the sides with coconut oil. Preheat the oven to 180°C/ 355F. For the dough, combine the almond milk with the apple cider vinegar and set aside. In a medium sized bowl, first combine all the dry ingredients and then add the liquid ingredients. Whisk the batter with a hand mixer until all ingredients are combined. Pour the batter into the cake tin and bake in the oven for about 35 minutes (or until toothpick comes out clean). In the meantime, place the ingredients for the almond orange cream in a high-speed blender and blend until you get a smooth texture. Place in the fridge until the cake is ready. Once the cake is baked, carefully take it out of the tin and let cool down before spreading the almond cream on it. Decorate with more spices and orange zest and enjoy! Recipe adapted from wallflowerkitchen – made changes according to my personal taste. Wow! This is an absolutely amazingly delicious recipe! I love it! Thank you K! !